By Ajahn Brahmavamso. A truly helpful and sophisticated manual of meditation written by a monk with deep and wide-ranging experience. Ajahn Brahm is one of a new generation of Westerners who have studied, practiced and mastered an important range of Buddhist teachings and now offers them to sincere practitioners across the modern world. In Mindfulness, Bliss and Beyond you will find a thorough set of teachings for developing and deepening meditation, aimed particularly at attaining absorption and opening to the insights that can follow from it. 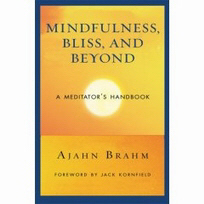 Ajahn Brahm offers a careful and subtle understanding of how to transform initial difficulties and how to incline the mind toward rapture, happiness, light and the profound steadiness of Jhana. So those of you interested in the practice of jhana and the depths of the Buddhist path: read this book carefully. And try its practices. Much will be gained from its rich and wise words and even more from the experiences it points to. And as the Buddha and Ajahn Brahm both advise, test them out, and use them, and learn from them, but do not cling to them. Let them lead you to the liberation beyond all clinging, the sure heart's release. May these teachings bring understanding, benefit and blessings to all. The first 5 chapters of Mindfulness, Bliss & Beyond is available as a preview. Venerable Ajahn Brahmavamso Mahathera (known to most as Ajahn Brahm) was born Peter Betts in London, United Kingdom in August 7, 1951. He came from a working-class background, and won a scholarship to study Theoretical Physics at Cambridge University in the late 1960s. After graduating from Cambridge he taught in high school for one year before travelling to Thailand to become a monk and train with the Venerable Ajahn Chah Bodhinyana Mahathera. Whilst still in his years as a junior monk, he was asked to undertake the compilation of an English-language guide to the Buddhist monastic code - the vinaya - which later became the basis for monastic discipline in many Theravadan monasteries in Western countries. Initially there were no buildings on the land, and as there were only a few Buddhists in Perth at this time, and little funding, the monks themselves began building to save money. So it was that Ajahn Brahm learnt plumbing and brick-laying and built many of the current buildings there himself. In 1994, Ajahn Jagaro took a sabbatical leave from Western Australia and disrobed a year later, abruptly leaving Ajahn Brahm in charge. Despite initial reservations, Ajahn Brahm took on the role with gusto and was soon being invited to provide his humorous and uplifting teachings in other parts of Australia and South-East Asia. He has been a speaker at the International Buddhist Summit in Phnom Penh in 2002, and at four Global Conferences on Buddhism. 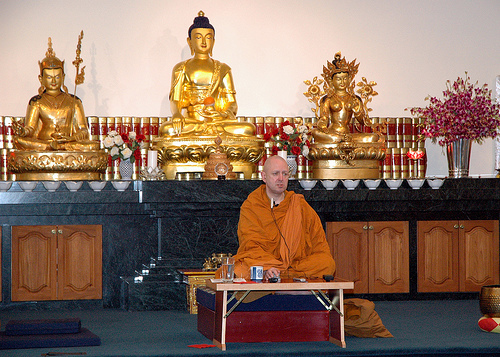 He was the convener of the Fourth Global Conference on Buddhism, held in Perth, in June 2006. But such recognition has not stopped him from dedicating time and attention to the sick and dying, those in prison or ill with cancer, people wanting to learn to meditate, and of course his own Sangha of monks at Bodhinyana. Ajahn Brahm has also been influential in establishing Dhammasara Nuns' Monastery at Gidgegannup in the hills north-east of Perth to be a wholly independent monastery for nuns, where the Sri Lankan trained, Australian nun Ajahn Sr. Vayama is currently abbot. Ajahn Brahm has also written two books including Opening the Door of Your Heart (fromerly published as 'Who Ordered This Truckload of Dung?') and Mindfulness, Bliss and Beyond: A Meditator's Handbook. Hundreds of Ajahn Brahm's Dhamma talks are now available for free download in both digital audio and video format. These are downloaded millions of times a year and it's now true to say that barely a second passes when there isn't someone, somewhere in the world downloading and listening to a Dhamma talk by Ajahn Brahm.